The native form of this personal name is tolnai gróf Festetics György. This article uses the Western name order. 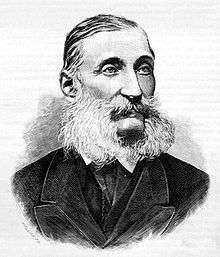 Count György László Festetics de Tolna (23 April 1815 – 12 February 1883) was a Hungarian politician, who served as Minister besides the King between 1867 and 1871. He was the offspring from the Hungarian noble family count Festetics de Tolna. His father was count László Festetics de Tolna (1785–1846), and his mother was Princess Josefine Hohenzollern-Hechingen (1790-1856). His paternal grandfather was count György Festetics de Tolna (1755-1819), who founded the prestigious agricultural college Georgikon, the first of its kind in Europe, that operated in the Festetics Palace in Keszthely. On 17 feb 1849 he married countess Eugénia Erdõdy de Monyorókerék et Monoszló (b. nov 1826, d. aug 1894). His son was count Tasziló Festetics, 1st Prince Festetics. ↑ "genealogy.eu festetics family 03". Marek, Miroslav. "Festetics family". Genealogy.EU.